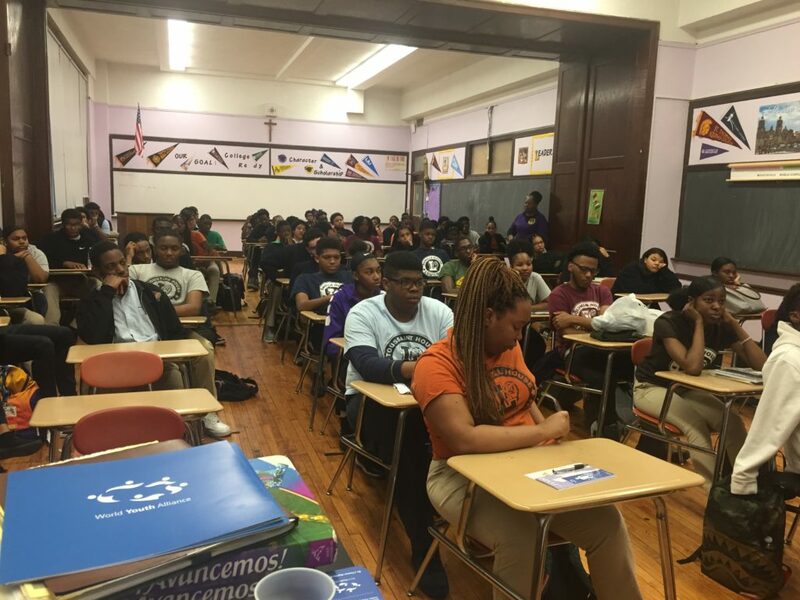 Brooklyn, NY — In early March, the North American regional office comprised of Regional Director Weronika Janczuk, Director of Operations Julia Kenney, and intern Alexandra Rose visited Bishop Loughlin Memorial High School (BLHMS). This was the second annual visit to the high school. A current BLHMS teacher who was a friend of Weronika’s during her undergraduate studies in New York extended the invite. The staff met with three large classes, ranging from 30-65 students in size, engaging the students on the history of the World Youth Alliance, contemporary issues in modern bioethics (i.e., surrogacy), and as well as leadership opportunities through the forthcoming International Summer Camp (ISC) and regional internships. One key question lay in the relationship between human dignity and human rights, and Weronika reminded students that the only reason we create rights and laws to mediate them is because they stem from the human person who possesses the worth that needs to be protected. Bishop Loughlin Memorial High School is a co-educational, preparatory school located in Brooklyn, New York. It is home to approximately 800 students of grades 9-12. For others interested in welcoming the NA staff, please email northamerica@wya.net.